In light of the recent protests concerning the democratisation of higher education, this short essay will develop two arguments; firstly, democratisation of the university requires a critical re-evaluation of the “demos”. Secondly, the We Are Here Academy is not an alternative to higher education – nor should it be – but a protest movement that strives for an educational system that is both inclusive and democratic. This essay will conclude with the argument that cooperation between the New University and “undocumented Dutch citizens” is relevant and necessary in order to stimulate and critically investigate how accessible higher education is, and, thus, the very meaning of a democratic university. I’ve been in the Netherlands for over ten years and this was the first time I sat in a lecture hall and got an education. In the spring of 2014, the We Are Here Academy opened its doors. This unofficial university offers university-level courses for undocumented individuals. 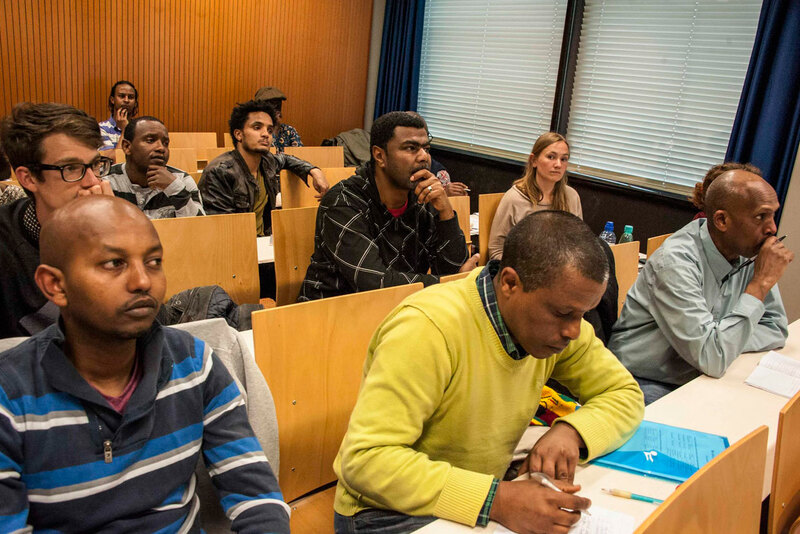 The students who attend are members of We Are Here, an Amsterdam-based self-organised collective of refugees in limbo. They have applied for asylum in the Netherlands, but their applications have been rejected by the Dutch Immigration and Naturalisation Service. However, they are unable to return to their countries of origin, which leaves them in limbo. For almost three years, and utilising various forms of protest, We Are Here has emphasised the so-called “asylum gap” where rejected asylum seekers are literally placed outside the gates of asylum seekers centres and are expected to await repatriation on the street. The asylum gap is a political vacuum where people without proper documentation are deprived of many of their rights and opportunities, placing them beyond the reach of political actors. They are labelled “uitgeprocedeerd”, by which we mean those who have “exhausted every legal avenue”, are “rejected” or “illegal”, leaving them with very limited opportunities to claim their rights or available assistance. In principle, the “undocumented Dutch citizen”, is simply expected to leave. In practice, however, the asylum gap seems to be a quasi-permanent situation for many. It is not uncommon for some of them to live in this limbo for more than 10 years. This means that the inhabitants of this limbo are permanently not entitled to housing, paid work, social security, decent healthcare and an education. In short, many elements of everyday life that documented Dutch citizens take for granted are withheld from undocumented Dutch citizens. This is far from being a negligent oversight or simple incompetence; it was, in fact, explicitly created and maintained to force the undocumented to leave on their own accord. The result has been that many elements of the everyday lives of documented Dutch citizens are instrumentalised to maintain a regime that continues to encourage undocumented Dutch citizens to leave.2 The recent “Bath, Bed, Bread” debate in the Netherlands led to the Dutch government having to capitulate and forced to provide basic shelter for undocumented migrants.3 This showdown revealed how little the current government is willing to provide for undocumented Dutch citizens, who endure an incredibly harsh life in the Netherlands with the deliberate deprivation of basic human rights. For documented Dutch citizens this means becoming involuntary accomplices in this criminal scenario. Many people have begun to speak up about this situation. From those who run the Vluchtkerk4 (Asylum Church) to those who have refused to file complaints against this building being squatted to the many volunteers who contribute food, money, time and care to the We Are Here protest. We would like to highlight one aspect of this struggle by focussing on one human right that is withheld from undocumented Dutch citizens: higher education. As described in article 26 of the Universal Declaration of Human Rights (UDHR), access to education is not only a basic right, it is deemed to be a basic right because it fosters “understanding, tolerance and friendship among all nations, racial or religious groups”. Yet, contrary to UDHR article 26, higher education is not accessible on the basis of merit. In other words, (lack of) documentation trumps merit. 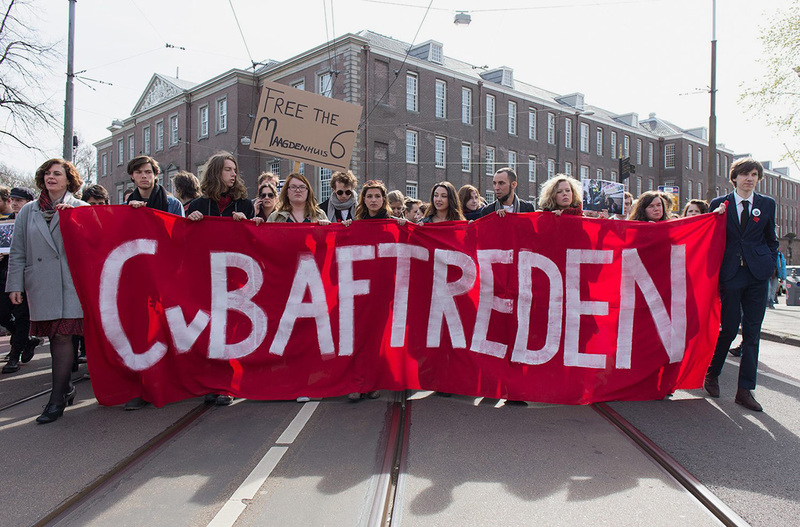 For students and staff at Dutch higher learning institutions, it means that their institutions, their work and values are being instrumentalised to uphold a criminal regime that promotes marginalisation. The We Are Here Academy was established to criticise this turn of events. The Academy upholds the rights of any person, whether they are legal or not, to pursue an education. This concept means that education, as a human right, should be accessible to one and all on the basis of merit, not documentation or legal status. At the We Are Here Academy, university-level courses are taught by professional lecturers on a voluntary basis. Just like other universities, every course concludes with an exam and if the student passes he or she receives a signed certificate that verifies that the student has passed a particular academic course. These certificates are personally signed by the lecturers. 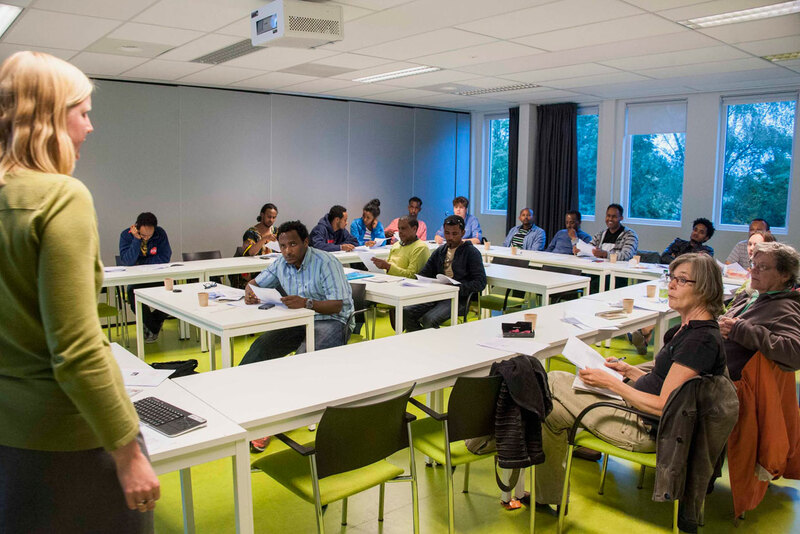 We Are Here Academy courses are taught in university classrooms and lecture halls but remain unsanctioned by official Dutch educational institutions and are thus not officially recognised by the university’s administration. 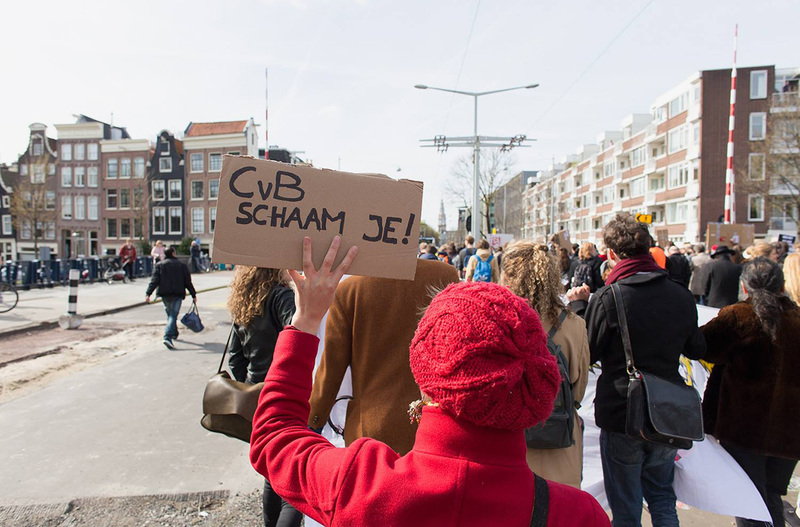 In solidarity with the Maagdenhuis occupation and the inception of the New University, we argue that the call for a democratic university requires a reconsideration of the accepted ideas and practices that determine membership and inclusion. When we discuss democracy we generally mean participatory rights: what rights do the people, the demos, have to make decisions. However, we are also confronted with the important question of who constitutes “the people” or the “demos”. Democratic participation is, in this sense, based on membership and inclusion. 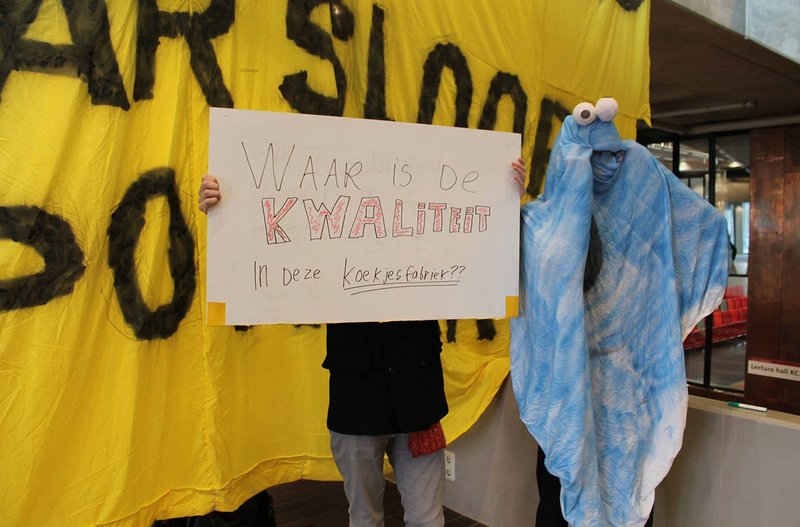 The Maagdenhuis occupation strives to emphasise a more responsive consulting body, transparent management and a departure from the neoliberal decision-making processes of universities. But who constitutes the university’s demos? Who is allowed to enrol and participate in this supposed academic democracy? Who is included and who is excluded? We argue that undocumented Dutch citizens play a crucial role in this discussion because they live with the consequences of the inclusion-exclusion mechanisms on a daily basis. They are confronted with the contradictions in the laws, norms and policies and live in limbo as a consequence. The We Are Here Academy offers students the opportunity to develop and educate themselves because, as noted by UDHR article 26, higher education is considered a valuable way to sharpen the individual’s mind, further his or her development and allow one to more effectively understand and influence the forces that shape their lives. It is not uncommon for Dutch politicians to tout the values of a highly educated populace, while simultaneously undermining this educational access and its quality. Meanwhile, the lives of these undocumented Dutch citizens have been put on hold with almost no opportunities for them to display or develop their talents, or the freedom to do something they desire. It is indeed difficult to remain positive, to give meaning to your life, when your days are a constant struggle to survive. How does this affect one’s ideas of self-worth? The We Are Here Academy offers people the opportunity to escape this survival mode and do something positive. It allows them to invest in themselves, develop their ideas, share them with others, make sense of their situation and better understand their environment. But, it also offers an important social dimension – it provides a space where people can meet and connect. The Academy, in effect, serves as a platform for knowledge exchange. But just to clarify: the We Are Here Academy is not a charity; it is a protest initiative designed to highlight the problems inherent to the current system, while, at the same time, providing undocumented Dutch citizens with the opportunity to emancipate. It provides a voice to people who have been silenced. Moreover, all the courses taught at the Academy are designed to enable students to make their voices heard and to facilitate their protest. From this idea have emerged a variety of courses ranging from asylum law, Dutch politics, history of protest movements, dance in demonstrations, and vocal training. However, much it is like any other appropriated and temporary space, the goal is not to fill the gap of a failing system but to advocate for systemic change. Spaces appropriated by protest movements usually do not serve as a permanent addition to an existing situation, instead they offer a utopian vision of what could be. 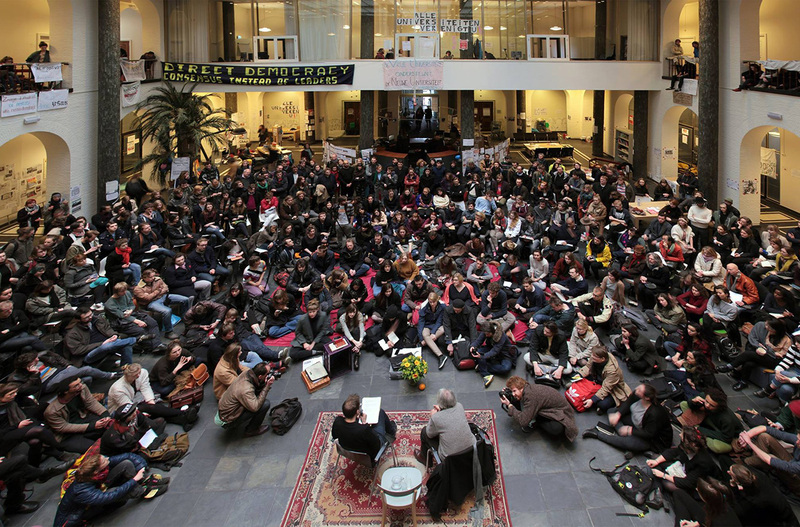 The lectures and classes offered in the Maagdenhuis are not meant to establish some clandestine annex to existing higher education institutions but confront the university with what higher education could and should be. Likewise, the We Are Here Academy sketches a somewhat utopian vision of a form of higher education that refuses to participate in the criminal acts of a regime that condones exclusion and marginalisation. Universities should focus on upholding their role as independent knowledge institutions, accessible on the basis of merit, not documentation or status. In order to truly democratise higher education, this type of undemocratic selection must stop because as long as documentation trumps talent, universities forfeit their function. And, moreover, undocumented Dutch citizens are robbed of yet another basic human right, and society misses out on the much-needed knowledge and talent they can offer. The New University and the We Are Here Academy together can lobby for a new, more inclusive interpretation of the right to education. 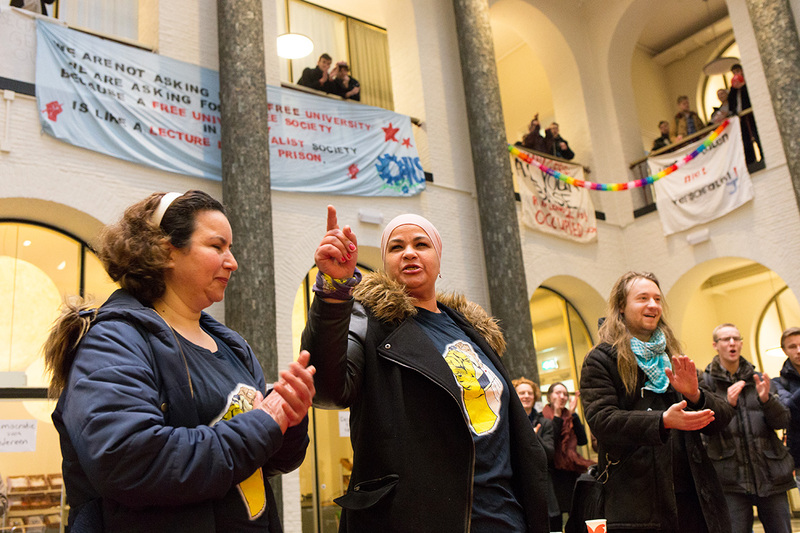 The Maagdenhuis occupation has already stimulated critical thinking and created a space for dialogue between students, university management and the government. Now is the time to utilise this space and transform it into something long-lasting and more meaningful. By joining forces, these initiatives can stimulate public support for the critical review of the meaning of “democracy” in the reform of higher education, and demand changes to the educational system. 2. See the essay “Nederland als ontmoedigingsmachine”: wijzijnhier.org. 4. 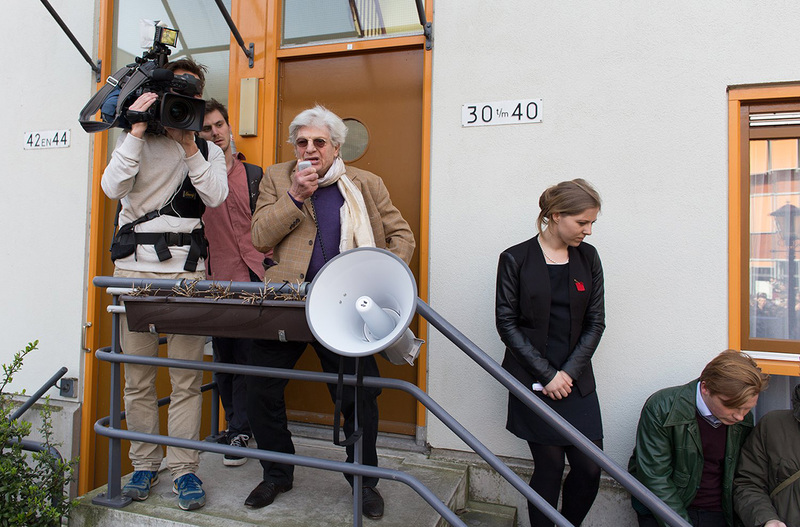 The first of a series of squatted buildings in Amsterdam in which hundreds of undocumented Dutch citizens have found shelter and were able to pursue their protest actions. 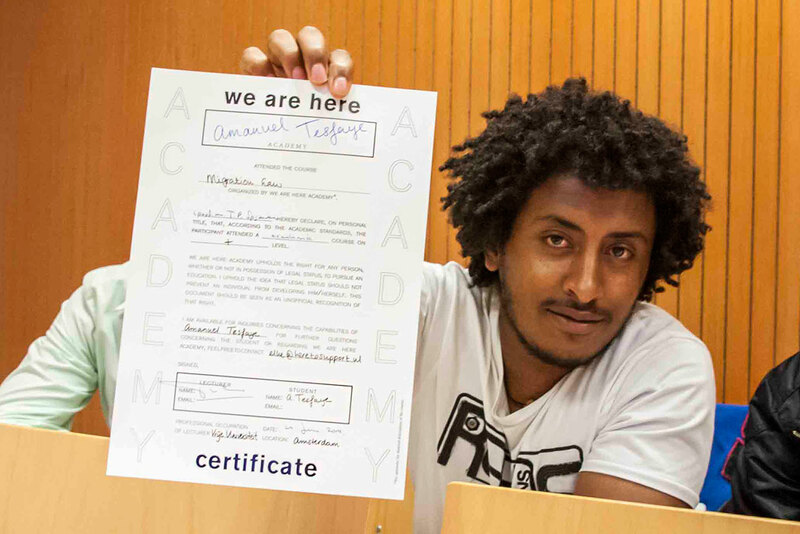 Yoonis Osman Nuur is a We Are Here Academy student and part of the refugee council of the Here to Support Foundation. As a human rights activist and politician, Nuur fights for the visibility and recognition of refugees in limbo, in Dutch society and law. See further: www.wijzijnhier.org. Djoelia van der Velden is an active supporter of We Are Here since 2014. She holds a MA in Conflict Studies and Human Rights and is currently working as a writer and researcher at the Here to Support Foundation. Of course, a movement like this doesn’t just spring up out of nowhere; last year’s occupation of the church at VU University Amsterdam by students in the Earth and Life Sciences faculty had similar causes as the much more visible Bungehuis and Maagdenhuis occupations by UvA humanities students this year. Both the VU’s Earth and Life Sciences and the UvA’s Humanities departments were facing a Texas Chain Saw Massacre treatment, with programs being merged or abolished altogether, and dozens or even up to 150 jobs being cut. Meanwhile, Erasmus University in Rotterdam announced that it was getting rid of its Philosophy faculty, treating it as excess baggage; shades of Middlesex University, which closed its influential Philosophy department in 2010. If Holland, and continental Europe in general, are just as affected by the implementation of neoliberal policies and the financialisation of universities as the UK, Canada and the US, the effects differ: in the Netherlands, the protests were sparked not by sky-high tuition fees inaugurating a life of debt but by the aforementioned cuts in programs and staff, and by the resulting sense that the university is being turned into a “cookie factory”, churning out graduates on the cheap. The amount of funding Dutch universities receive from the state per student continues to dwindle, and this has precipitated a growth drive that, in a proper Freudian manner, reveals itself to be a death drive. As the total number of students continues to grow, the strain on the budget only becomes more intense.3 A few years ago, the Humanities department staff at one Dutch university were informed that as a result of this mechanism, they would have to expand by some fifteen percent each year in order to safeguard their budget. Meanwhile, there is an increasing dependency on third-party funding and on the state’s Stalin-like, neoliberal funding body, the NWO – which steers Humanities research via its near-exclusive focus on “the creative industries” and a technocratic understanding of digital humanities. 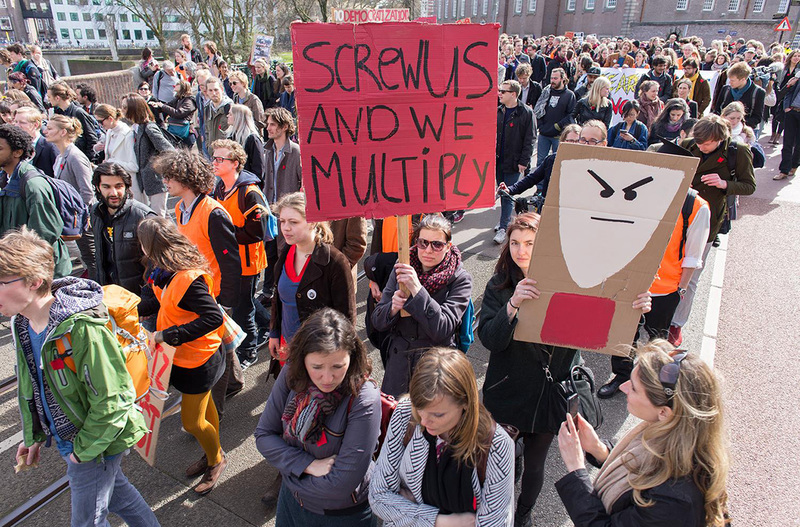 That the funding calculus may pan out differently per university and even per faculty within a university provides ample room for infighting and backstabbing.4 Furthermore, the protests often remain localized, and students are attacked in the media and online platforms as privileged and spoiled brats—even though the Maagdenhuis occupiers insisted on framing their actions as part of a more general struggle of a steadily worsening status quo, and on the forging of alliances with groups who are in far worse legal and economic situations. The aim of this “virtual round table” is both to learn from their actions and provide a platform for thinking beyond this particular situation. The strategy in presenting a constellation of short texts by professors, lecturers, PhD candidates, students and alumni, as well as by artists and activists, is to further the analysis of the present situation (in the Netherlands in particular) and the development of strategies and practices after the police evicted the Maagdenhuis occupiers on April 11. But the “new university” doesn’t need to be something that is merely discussed ad infinitum as a beautiful project forever awaiting its actualisation. As some of our contributions stress, the Maagdenhuis was the new university; with its daily program of talks and discussions; the students turned the production and problematisation of knowledge into a matter of common concern. As everyday praxis, as a reconfiguration of academic protocols, the Maagdenhuis “reappropriation” was both political and aesthetic practice; it was a commoning of the financialised university that was for all to see and sense, and participate in. Anachronistic and perverse though it may seem to invoke these precedents at a moment when posthumanist theory holds sway over much of the humanities (or should that be: the posthumanities? ), we find ourselves in a strikingly similar situation. Now that the institution has been occupied by a managerial caste that imposes “financial necessities”, some opt to leave, others withdraw. What are the strategies for reappropriation, for infiltration? How do we construct actual academies – no matter how temporary and fragile – within academia?